It was chilly outside this morning, and the yellowing leaves on the trees reminded me that fall is right around the corner. 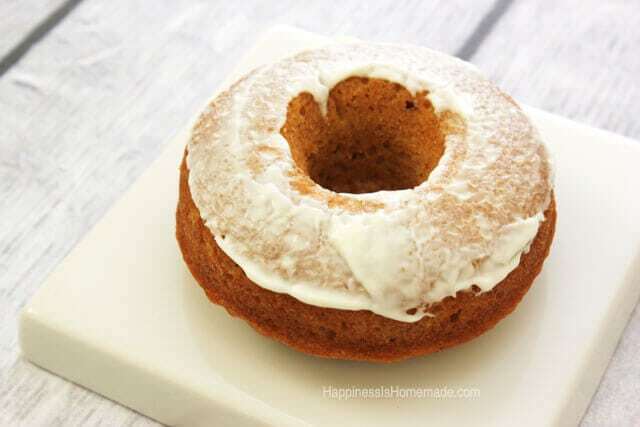 After all that talk about gluten free donuts the other day, I was dying to whip up a batch of pumpkin cake donuts to hang on to that almost-fall-feeling. 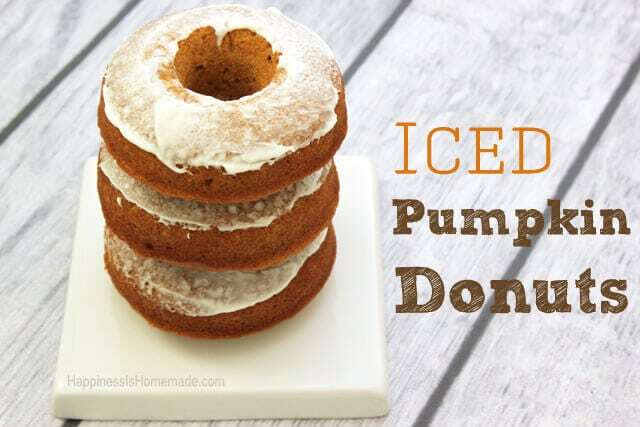 This pumpkin donut recipe is not gluten free, but I’m sure that it could be altered with the substitution of gluten-free flour if necessary. I used my favorite pumpkin bread recipe to make these donuts, and I have to warn you that it makes a huge batch. I made a dozen donuts and still had enough batter left over to make an entire 9″x13″ sheet cake, so if you don’t have a small army of growing boys to feed, you may want to halve the recipe. Preheat oven to 350 degrees. In bowl #1 mix together oil, sugar, applesauce, eggs, pumpkin puree and water. In bowl #2 mix together flour, baking soda, salt, baking powder, and spices. Combine both bowls and mix well. Spray donut pan and/or cake/loaf pan lightly with cooking spray. Bake donuts for 8-11 minutes; 9″ x 13″ cake pan for 25 minutes; loaf pans for 45 minutes. Cool on wire rack before lightly icing (I cheated and used store-bought cream cheese frosting to top off our donuts since I had hungry kiddos waiting!). Enjoy! Oh wow, these look amazing! Thanks for the recipe, I’m pinning this for sure! wow, these look amazing! wonderful fall recipe! Oh my! These look so good! Im such a huge pumpkin fan, especially this time of year! Im going to pin these so I can make them later! Make it a great day Heidi! Question: the instructions don’t say when to add the sugar. Do you combine it with the other dry ingredients before combining the wet and dry ingredients? Thanks! Can’t wait to make these. I just pureed 20 cups of pumpkin and am experimenting with different recipes. Yum! These are delicious and very easy. I’ll make them again and again. Yum!